SanDiegoVille: Calling All North PB Businesses | The Inaugural North PB Sip 'N Stroll is Coming August 4th! 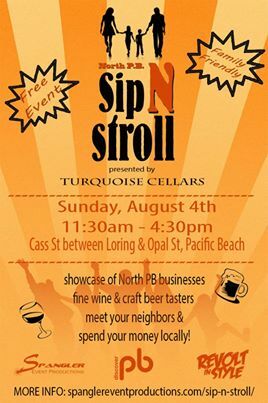 Calling All North PB Businesses | The Inaugural North PB Sip 'N Stroll is Coming August 4th! Presented by Turquoise Cellars, the Inaugural North PB Sip ‘N Stroll is moving forward after reaching their goal of raising $5,000 in local sponsorships! The North PB Sip ‘N Stroll is a free to attend, family friendly event aimed at promoting North PB businesses, while also bringing together the community, serving as a platform for residents and families to get to know one another while enjoying tastes from local restaurants and sipping on craft beer and fine wine. Mark your calendars and get onboard, because Sunday, August 4th will be here sooner than you think! In this struggling economy, communities need to come together and encourage spending money locally. And what better way to support your community than to stroll through the neighborhood streets, sipping a frosty beer from Amplified Ale Works, wine from Turquoise Cellars, nibbling cheesesteaks from Alex's Brown Bag, and shmoozing with the neighbor you never knew was the CPA, attorney, landscaper or the carpet cleaner you've been looking for. Mike Spangler, a North Pacific Beach resident and President of Spangler Event Productions, along with the support of Discover PB and the Pacific Beach Town Council, are producing this event devoted to giving back to the community, with fifty percent of the net proceeds going to Discover PB. The event producers and participating businesses are also coming up with creative ideas to raise money for other organizations, such as the partnership with Go Green for Education, a Pacific Beach recycling program that gives their proceeds to Pacific Beach elementary schools. And get excited for a Dunk Your Local Principal, Teacher or Politician! tank, proceeds from which will go straight to the schools. This FREE event will be held on Sunday, August 4, 2013 from 11:30 am - 4:30 pm on Cass Street between Loring Street and Opal Street. 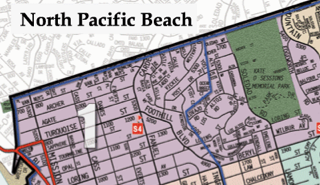 Be sure to follow the North PB Sip 'N Stroll on Facebook for updates! And always shop locally! Sponsorships, booths and table space are still available! For more information email sepeblast@gmail.com.